Venue: Home of Keith and Donna L.
1st. Rank: Gary C., Jim P. (Der Alte Fritz), Chuck L. and Michael M.
2nd. 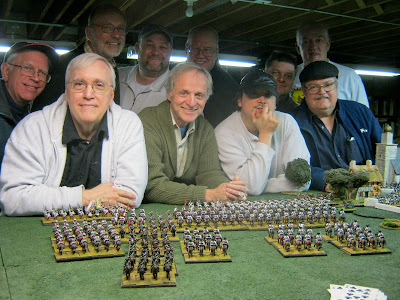 Rank: Bill P. (Birthday Boy), Earl K., John B., Brent O., Curt B and Keith L.
It is vital to game with friendly, easy-going, funny and knowledgeable companions. We are very lucky in this regard. Scrumptious chow helps too. Fortunately we are able to take lunch breaks like this, engage in companionable conversation and finish games to conclusion. 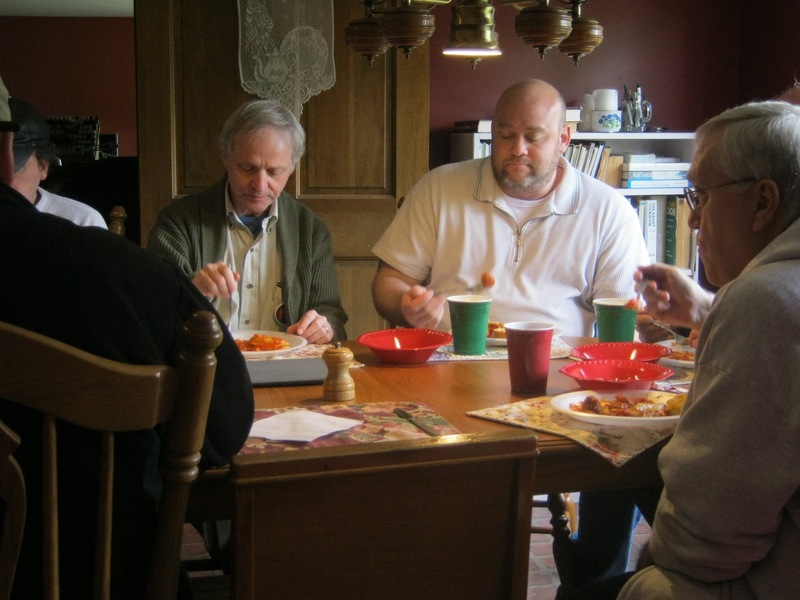 From left to right: Brent O., Keith L., Curt B. and Chuck L.
Donna prepares a great table for us every time we are at Keith and Donna L's home. From right to left: Gary C., John B. and Jim P.
In mid-afternoon we took a second break for Birthday cake. 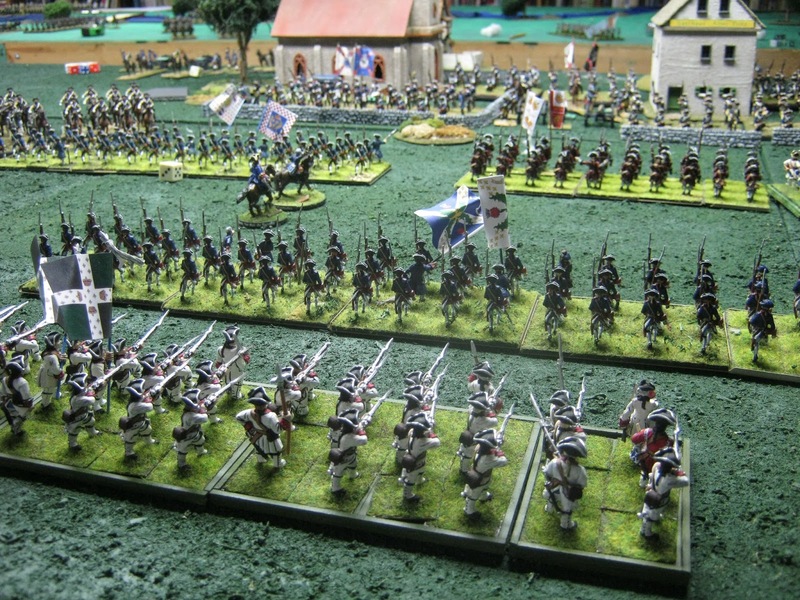 "...The Battle of Weissenfels fought during the 1758 campaign. An Austro-Franco-Saxon army under Marshal Soubise is approaching Brandenburg from the west. 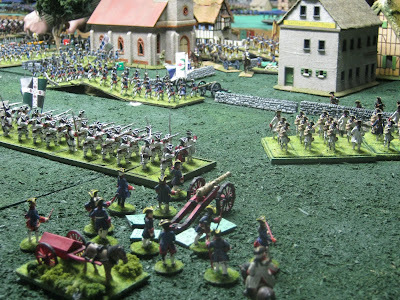 Frederick has gathered in his forces and marches west to meet them, not too far from the old Rossbach battleground. 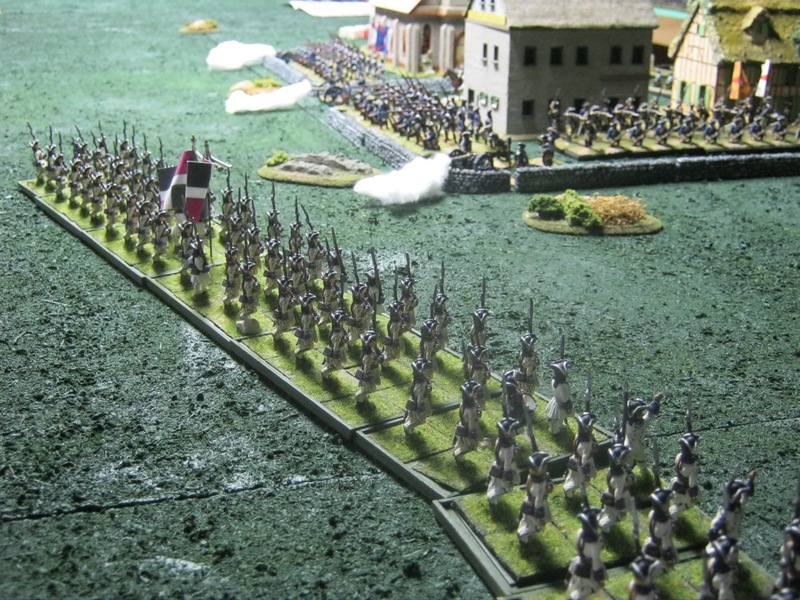 The Prussian army has just begun to cross the Saale River at Weissenfels, having thrown several pontoon bridges across the Saale. 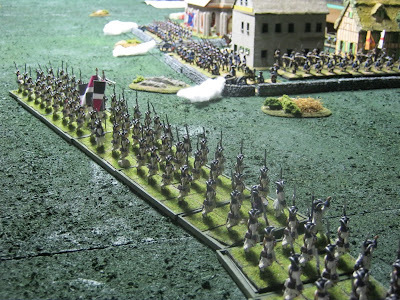 Soubise is particularly energetic this year and decides to attack Frederick before he can get all of his forces across to the western bank of the Saale." 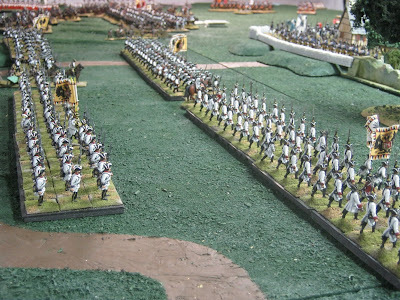 "The Prussians have secured a bridgehead across the Saale and have anchored it upon two villages: Altenburg on the left flank and Eisenburg on the right flank. A brigade of infantry have occupied each village and have worked to prepare these defensive positions against the expected Allied attack." 2/Auvergne (left) and a little of 1/Auvergne (right) advance into the gap between Altenburg and the table edge. 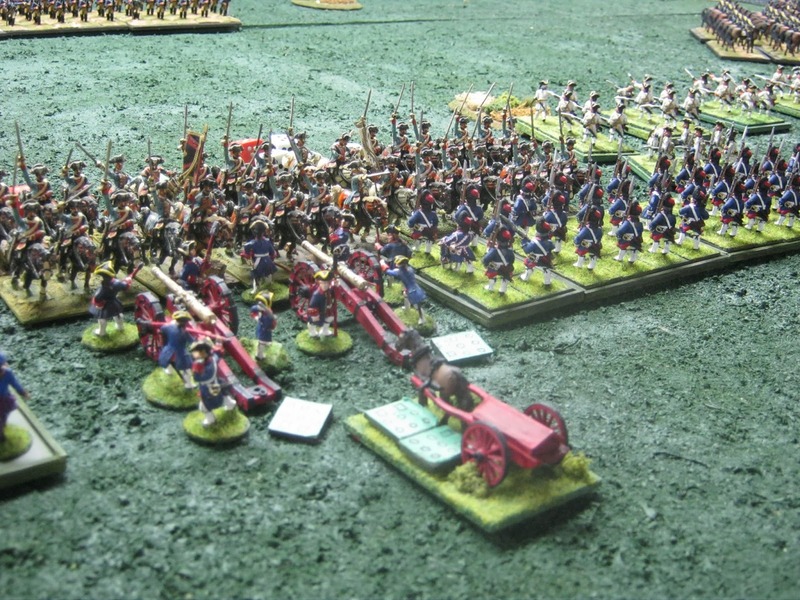 Prussian cannon fire begins to take its toll. Altenburg is off image to the left. French press forward to the Center Table back edge. Meanwhile the front of Altenburg received considerable attention too. 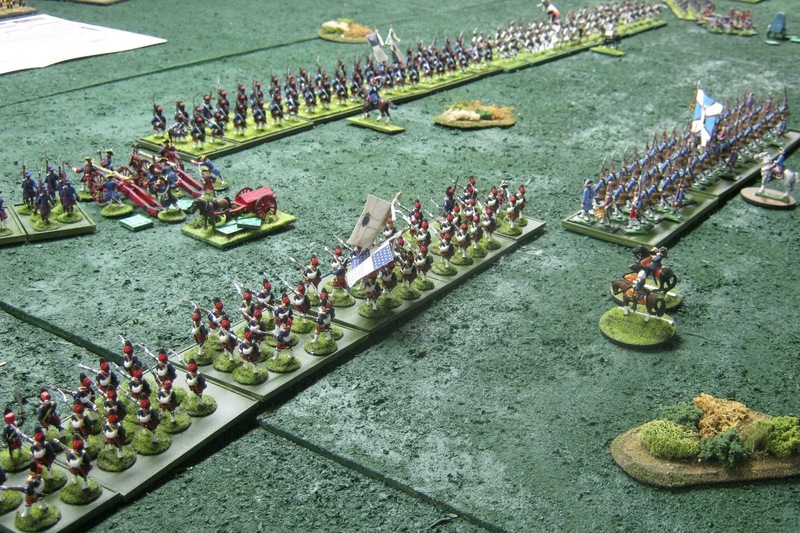 Prussian kürassiers (upper left) are charging into the French to stop the advance cold. Here they are en-masse. 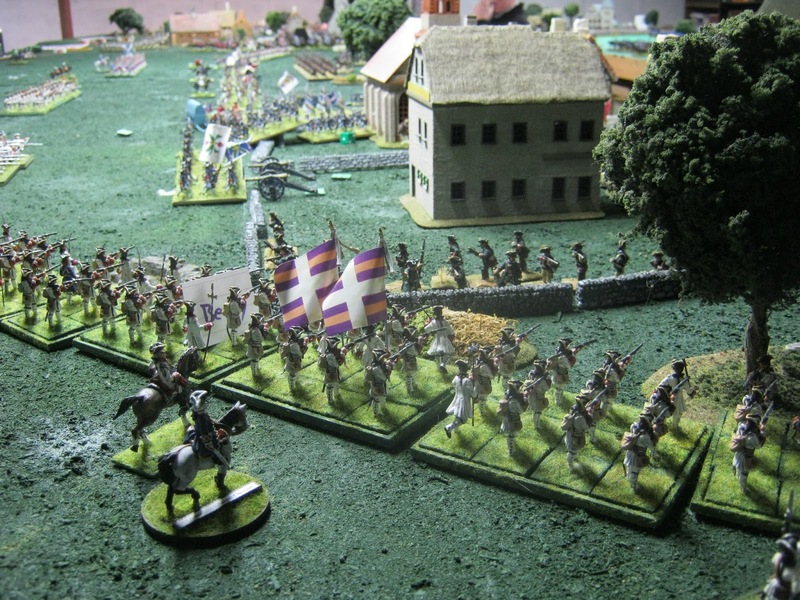 The left-hand kürassiers did not tilt the situation to Frederick's advantage but the right-hand body crashed into the flank of a French battalion causing it to rout. 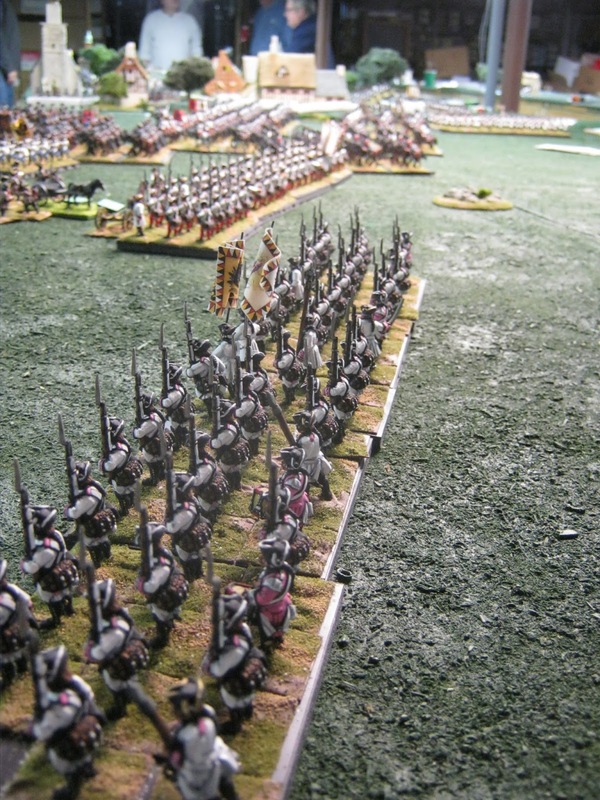 Whilst to the left of the previous photo, Prussian dragoons charged home into a battery of 8 pounders and 2/Grenadiers de France. 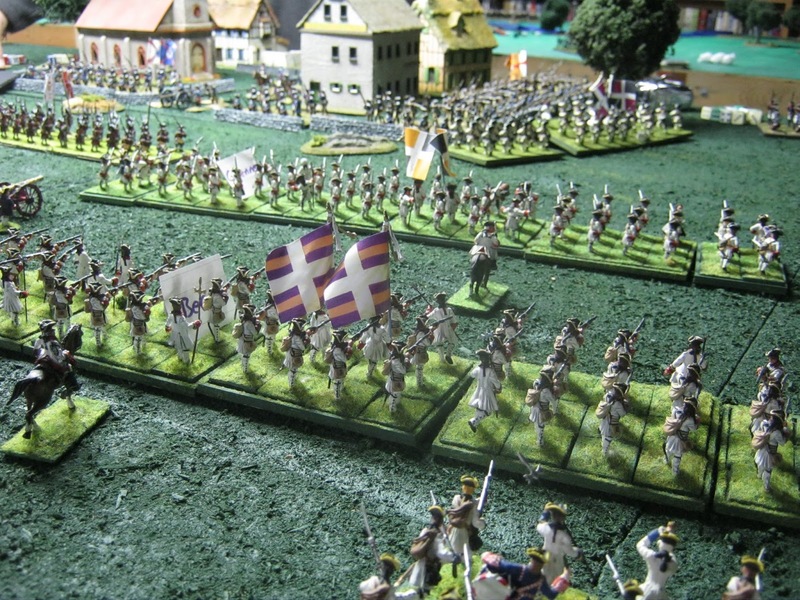 The Prussian charge slowed the French advance. Afterwards the French line stabilized. 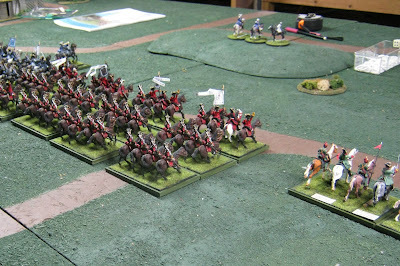 Back at the far French right flank Bercheney's two Hussar Squadrons and three of Saxon Leib Kürassiers await their moment to cross from the Center to the Back Table. By 4:30pm Altenburg still bravely held out as the aforementioned Allied squadrons crossed over to and turned left on the Back Table. 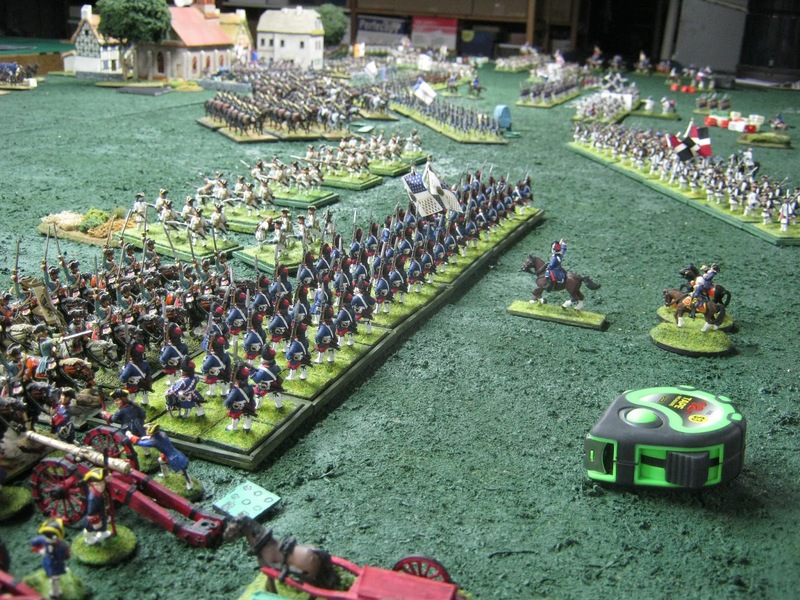 Would it be a last stand versus overwhelming numbers or would Prussian cavalry reserves thundering to help throw back Allied horsemen? 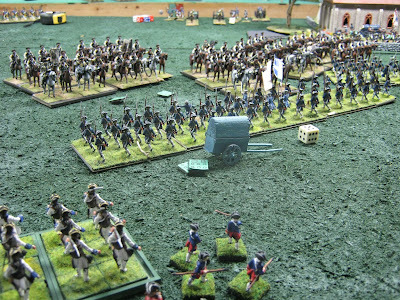 Marshall Soubise observed the battlefield from a hillock on the French Back Table. From there he saw the French attack on Altenburg to his right and the Austrian drive on Eisenburg to his left. 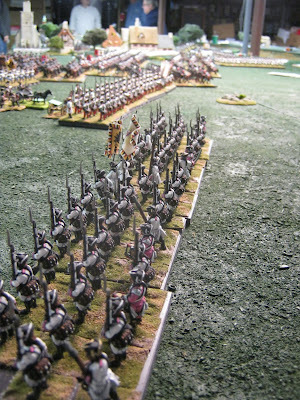 Two brigades of heavy cavalry awaited events behind him. 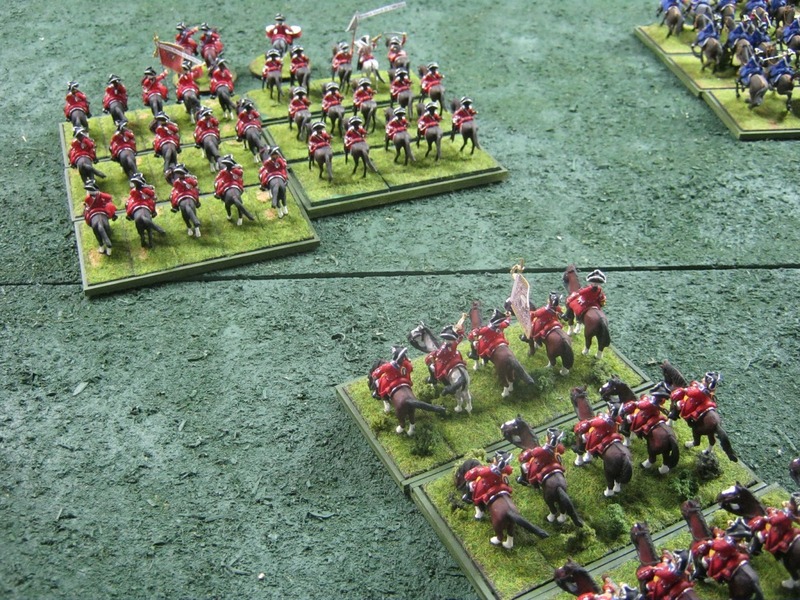 These consisted of Royal Carabineers, Commissaire General, Gendarmes and Royals. 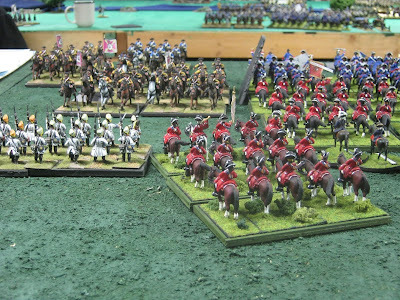 Behind these were Saxons of von Brühl's Dragoons, Rutowski's Chevaulegers and de Saxe Lanciers. 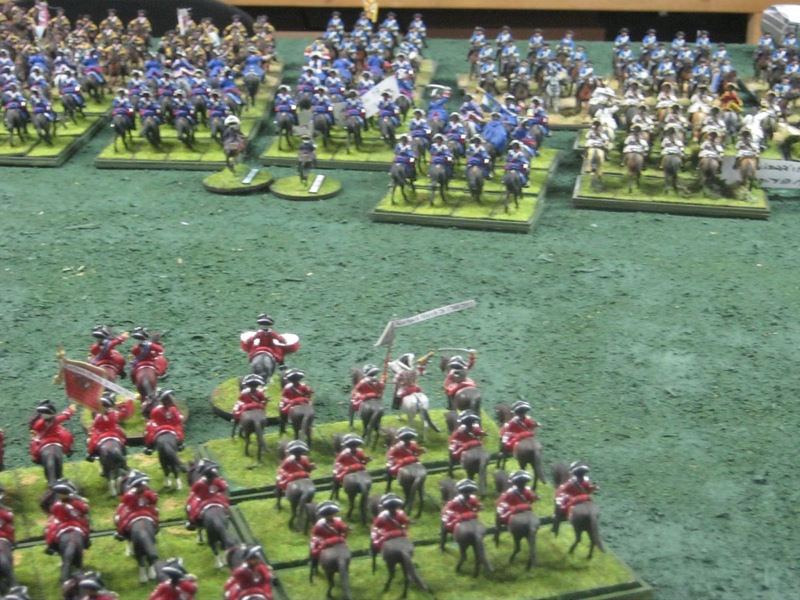 Total: 3,000 horsemen; a mass de decision. 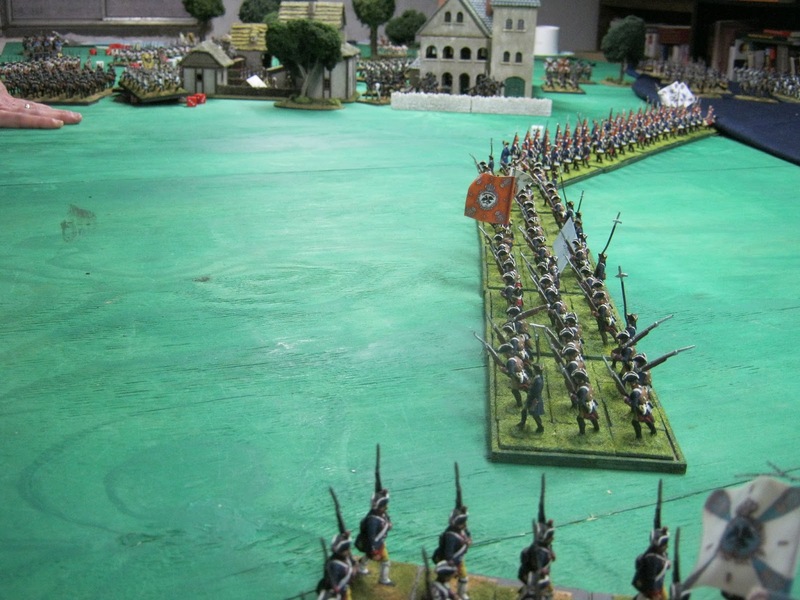 An Austrian courier arrived asking for protection to it's exposed right flank shown above. Otherwise the advance on Eisenburg would be compromised if attacked in flank. Soubise breakfasting on pastry (brought by Gary C.) was at first indifferent to the request. He assured the courier help would be forthcoming without saying when. He was also silently reticent to have the whole Army, left center and right be locked in an attack at the same time. 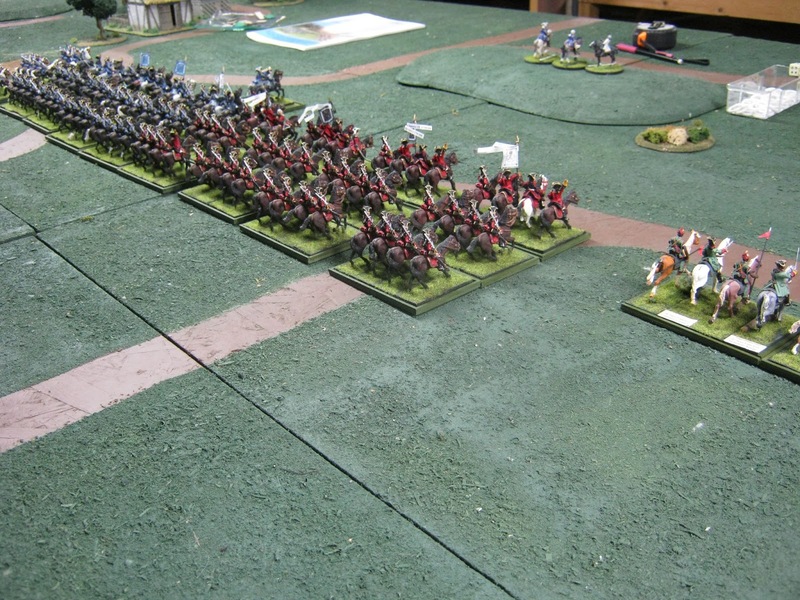 Besides this the pincer attack was developing nicely on both flanks. Awaiting events was the thing to do and there was more pastry (Donna's) to consume. The Prussians were not be lured forward to threaten the Austrians attacking Eisenburg. Why? They were guarding vital Salle River bridgeheads; not shown. Hence, the mysterious trap Soubise envisioned would never unfold. So by mid-morning thinking he must support his allies, all French squadrons cantered onto the Center Table for the first clash of swords above. As Gendarmes and Royals (barely shown on the right) wait in reserve. Photo courtesy of Jim P.
French horse (middle right) pursue the Prussians almost to one of the bridgeheads. 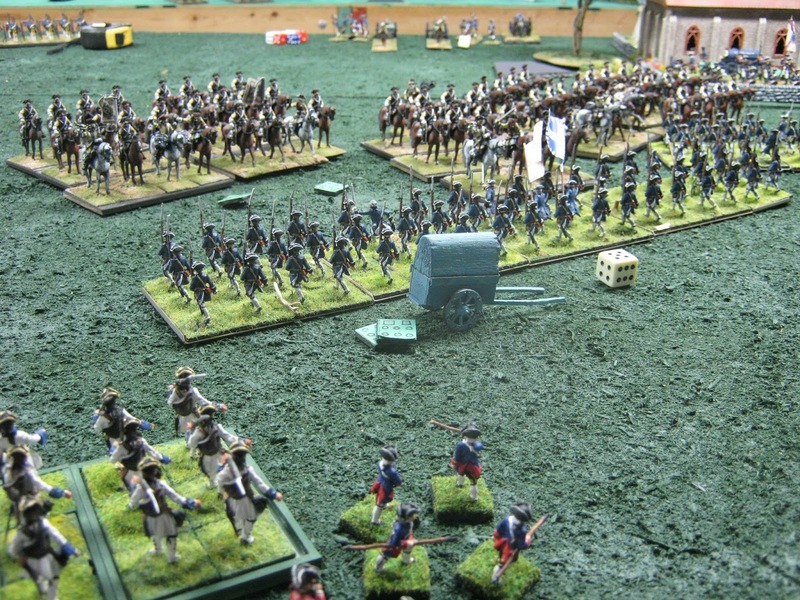 The same white and blue-coated pursuing French horse from the opposite direction from above. 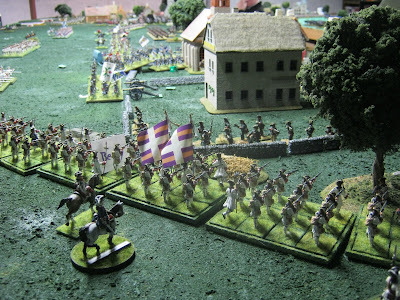 (Center of photo heading right) Photo courtesy of Jim P.
Soubise still on the hilltop held the Saxons back as his last reserve. Calling for more pastry, drink and birthday cake. 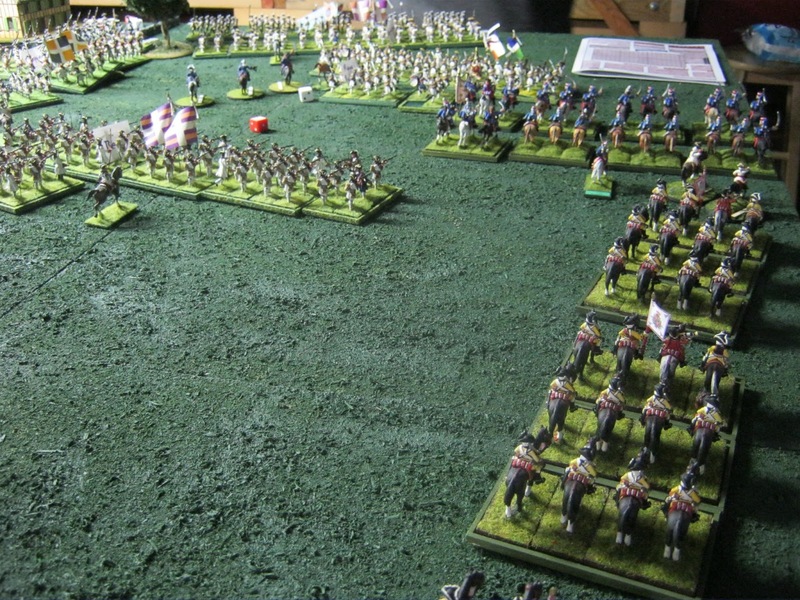 The Austrians greatly outnumbered Prussian defenders on the Left Flank. Prussian defenders await the onslaught in Eisenburg. The extreme right flank of the Austrian line before Eisenburg. Though Prussian firepower was brutal turn after turn, the Austrians managed to enter the village. Far to the left of Eisenburg more Austrians cross the plain. Arriving at the back edge of The Center Table. Eisenburg is to the right. 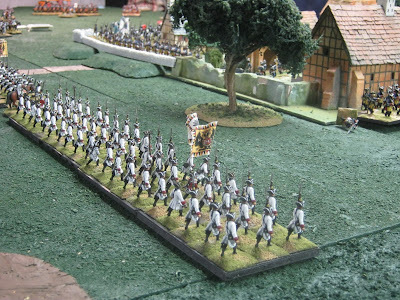 Prussians nearby form close to the Salle River guarding the retreat. 1. Jim designed an asymmetrical game. 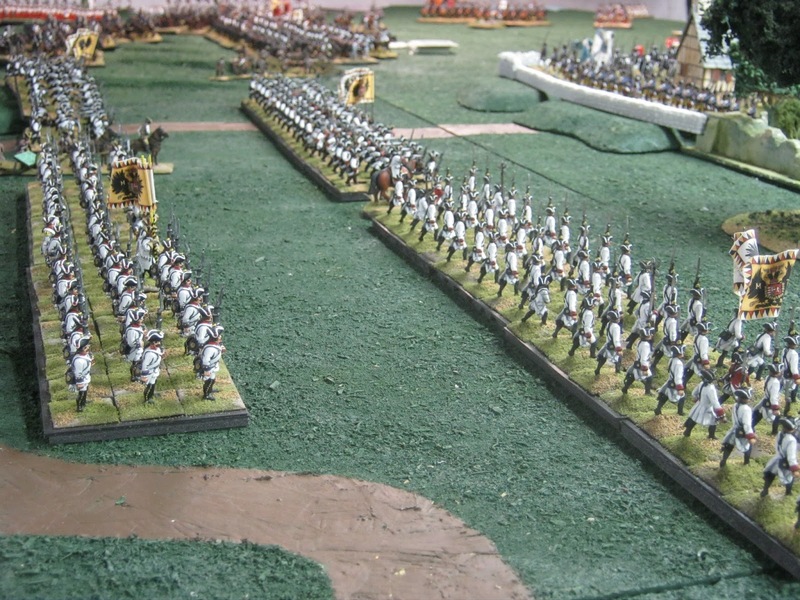 The Prussians were outnumbered by about 30%. They had to move units across the Salle River turn by turn by dice throw. A tough mission. Meanwhile, Altenburg and Eisenburg were to defend the line like WWII's Pegasus Bridge or Bastogne. ("Hold until relieved.") 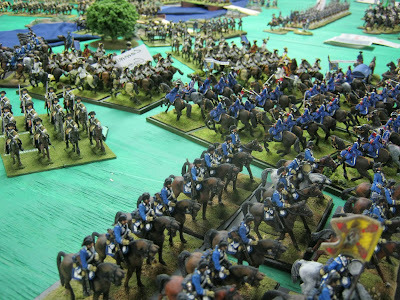 Prussians holding both villages were very tough customers. Had their cavalry attacks been luckier, the result would have been different. 2. 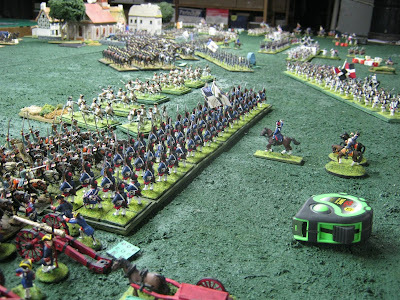 We deployed on three 6'x28' tables inspired by the original Wargames Holiday Center in the UK. 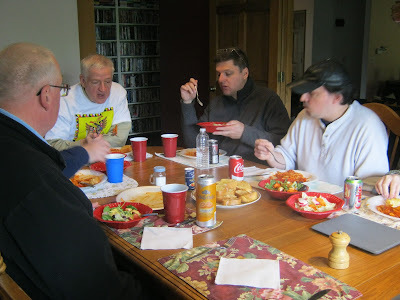 Most action took place on the Center Table. 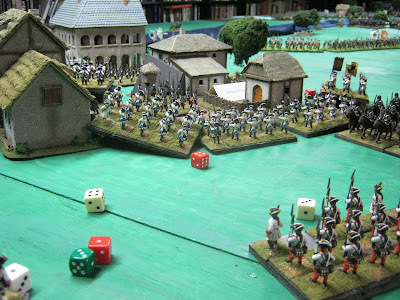 Back Tables were very useful and needed for reserves. By mid-afternoon the Prussians on their Back Table flanks were engaged by foes. Keith and Donna for the venue, terrain and chow. Jim for scenario design, bringing units and buildings. Michael for bringing units for both sides. Earl, John, Curt, Chuck, Brent, Michael, Gary, Jim and Keith for playing. 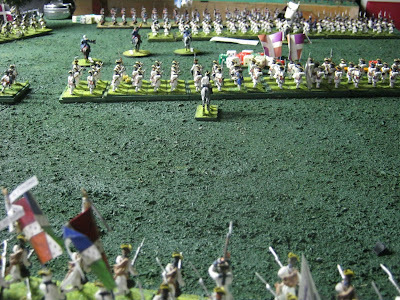 You can do Spectacle Wargames too. What do you need? Companionable players who know the rules. Players who play fast wanting to get in a maximum number of turns. No soliloquies/speeches. Limited history lessons, demands to change rules. No observers to slow down the process. Friends willing to provide units and terrain. Not removing individually based miniatures. Use a roster. Set-up mostly prior to game day. 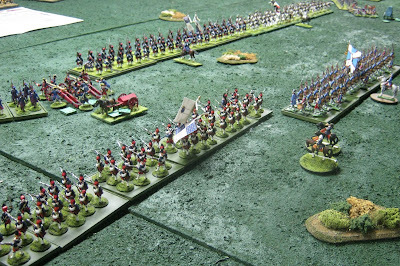 Rules that are fast playing, allow for long distances to be traversed and which do not deny officers or units opportunities to activate every turn. 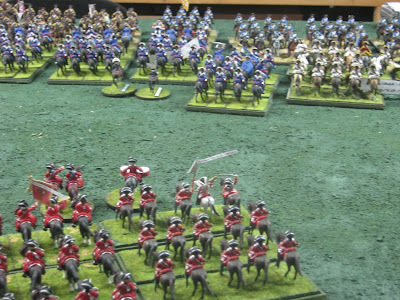 Imagine how long it would have taken Soubise to activate the French cavalry forward onto the Center Table otherwise. 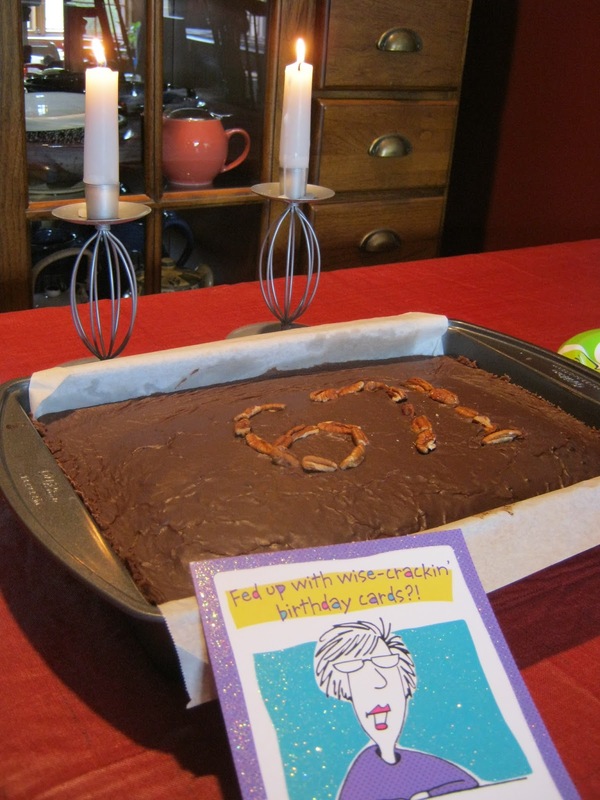 It would never have happened even without pastry consumption. Comments welcome and desired at Remarks below. Leave some won't you?